Package Acrobat Reader as an on-demand application with VMware ThinApp using Windows XP Pro and VMware Workstation with this step-by-step guide. Although initial adoption of desktop virtualization was slow, it is now steadily gaining popularity. Consumers hesitated to buy in to the technology at first because the benefits weren't as clear as with server virtualization, and many considered the total cost of ownership (TCO) too high. VMware ThinApp, developed in response to these issues, creates an on-demand application experience for the virtual desktop user and can save storage space, reduce support costs and preserve application settings as they can be controlled by the administrator instead of the individual user. 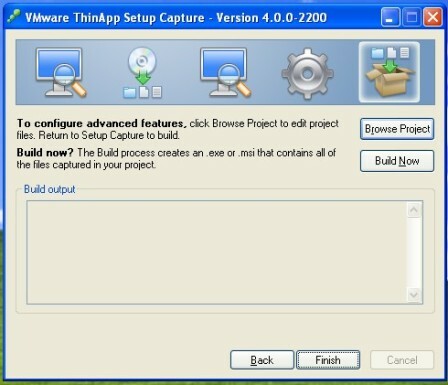 In the first part of this two-part series, we discussed how VMware ThinApp works. Now we'll walk through how to package Adobe Acrobate Reader for use with desktop virtualization using VMware ThinApp, Windows XP Professional and VMware Workstation. 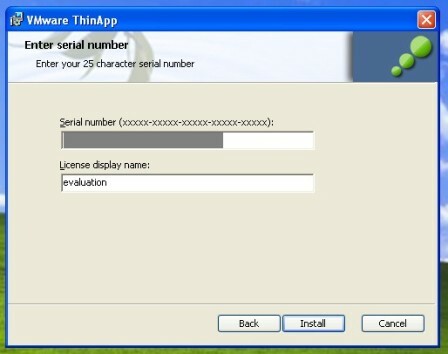 To fully evaluate ThinApp you will need the VMware ThinApp software with an evaluation serial key, VMware Workstation and an evaluation license, a copy of Windows XP Professional (Microsoft Select Agreement, Microsoft Developer's Network (MSDN) or a personal licensed copy) and Adobe Acrobat Reader. Installing ThinApp is generally a simple process. Launch the setup executable file from within your virtual machine and follow the wizard. During installation you will need to enter your evaluation serial key and a license display name. The license display name is shown each time a ThinApp application is launched on a client machine. Enter your evaluation serial key and license display name during installation. Before you do any work with ThinApp, I recommend that you snapshot your virtual machine. This will allow you to revert back to a clean Windows XP state if something goes wrong. To create a snapshot, go to the VM menu and select Snapshot, then Take Snapshot. Taking a snapshot of your Windows XP VM. Once you've taken the snapshot, copy the Acrobat Reader installer to the Windows XP VM. You are now ready to capture Acrobat Reader and turn it into a ThinApp package. From the start menu in the Windows XP VM, click Start, Programs, VMware, ThinApp Setup Capture. In the wizard, click Next to proceed through the first two screens. This will start the re-scan process. This is a quick process because, as you will see, there isn't a lot on the screen to account for. Once complete you will be presented with the dialog shown in the figure below. At this point, you should minimize this window and install and configure Acrobat Reader. Install Adobe Reader as you normally would. Once you have finished configuring Acrobat Reader, close the application, restore the VMware ThinApp Setup Capture window and click Next. All of the changes that were made during installation and configuration of the Acrobat Reader product are captured by the wizard. ThinApp captures all changes made to your system. Continue to click Next on the wizard pages. 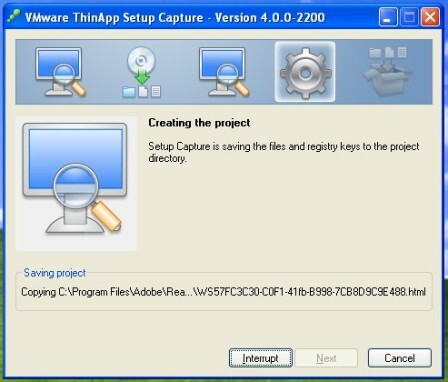 Eventually you will see ThinApp create the project directory containing all the captured information. Click Build Now in the wizard to compile the Acrobat Reader package. 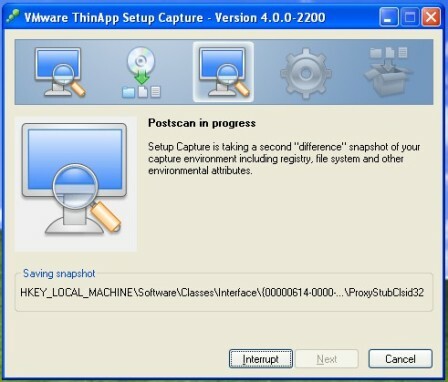 The ThinApp client is encapsulated into the package at this time. Compiling your Acrobat Reader package. Once the compilation is completed, click on the Browse Project button. Navigate to the bin folder. Copy all files to a network share location. Once you have a copy of the files, select Revert to Snapshot from the VM Snapshot menu in VMware Workstation. The virtual machine will be reset to its original state prior to the capture process. From your network share, run the Acrobat Reader executable file. Your ThinApp version of Acrobat Reader will launch. Notice that you see the ThinApp popup with your 'Licensed to …' details in the bottom righthand corner as you launch the application. "Licensed to …" details are displayed each time you launch a ThinApp application. Adobe Reader will launch. If you browse your local file system you will see that Acrobat is running, with a zero footprint on the Windows XP VM. Congratulations, you have created your first ThinApp application.